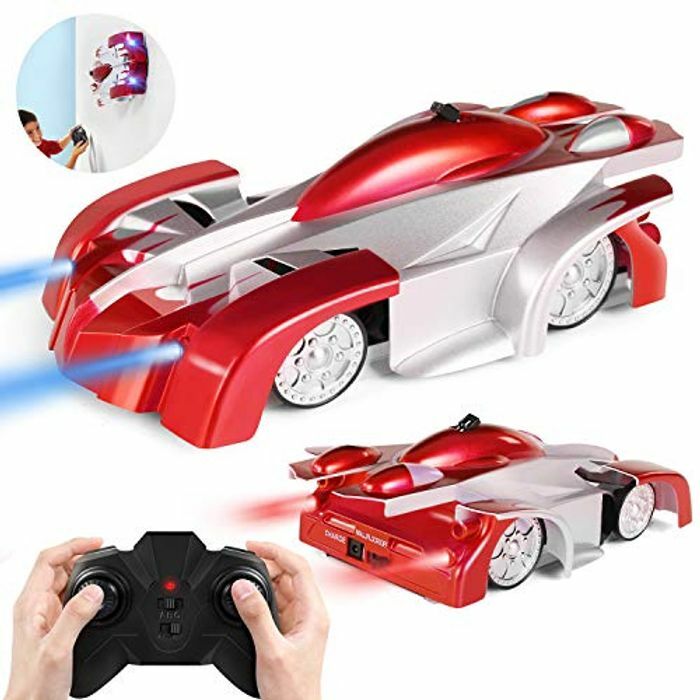 the super absorption feature under the remote control car allows this RC car to move on all smooth surfaces in WALL mode, including walls, ceilings, windows, mirrors and closets. And in FLOOR mode, the wall climber can move faster than all ordinary race cars. UPDATED REMOTE CONTROLLER: This updated controller only requires 3 'AAA' batteries unlikes the previous model that needed 6 'AA' batteries, making it more efficient and eco-friendly. Also, its compact and light design perfectly fits into your child's hand with easy grip. 360 ° STUNT ROTATION: One of the most fascinating feature of the stunt car is its ability to spin 360 degrees clockwise and counterclockwise when moving forward and backwards. This feature will keep your child entertained for hours. The wireless remote controller gives the user full control of the wall climber. QUALITY GUARANTEE: The cool and stylish stunt car body is made of premium long lasting ABS plastic ensuring resistance from impact. And with exceptional service, we provide 30-day hassle free return policy. I've ordered this one last time it was posted here. It's a small piece of plastic, nothing special about it. I won't pay again £15 for it. morpheus Don't get me wrong, it does what it says: you can play with it on the wall, on the ceiling or on hard floor. Some people might find it interesting. hpfanatik i need to protect the forum i will leave it expired.if the owners tell me to re-install i will.